We’d love your help. Let us know what’s wrong with this preview of Why Dirt Is Good by Mary Ruebush. 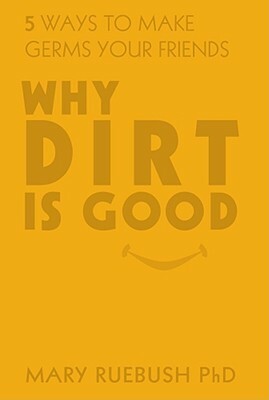 To ask other readers questions about Why Dirt Is Good, please sign up. I've read plenty of scientific books that are both educational and delightful to read. This one wasn't. The writing came across as condescending and shrill. I rolled my eyes at each "mother nature" use (three times in one paragraph? Really? ), and began to say "no, *you* do that!" at every use of a we or you pronoun. I'm a fan of outdoors, dirt, handwashing, environmentally friendly products, and not using antibiotics unless really needed. I was before reading this book. I'm glad the message is g I've read plenty of scientific books that are both educational and delightful to read. This one wasn't. The writing came across as condescending and shrill. I rolled my eyes at each "mother nature" use (three times in one paragraph? Really? ), and began to say "no, *you* do that!" at every use of a we or you pronoun. Scanned this book last night--but somewhat of a disappointment. Although the author appears to be a professional in her field of microbiology and immunology, there were no studies cited nor statistics given to prove her point: that dirt is good, and a little dirt as you are growing up will enhance, strengthen and develop a healthy immune system. I don't disagree with her basic premise, but I'd like to see some evidence! A great title and an important topic that needs to heard more. We live in community with all the natural things around us and in us, we need to respect that more if we are to survive as a species. Claire, you could have written this book, and I bet it would have been funnier! Matt, if you want an intro to Immunology (T cells and the like) read the first part. Christine told me about it. Now, Claire and Christine, I still have a question. If *I* avoid the antibacterial soaps and the like, can I still get a "super bug"? There is one I hadn't heard of VRSA, worse than MRSA apparently. A great explanation of why we need germs and why living in an antiseptic environment is destroying our immune systems. The chapter about allergies was especially enlightening. I feel vindicated for not investing in cart covers, antibacterial soap and all the other germophobic products marketed to parents. I passed this one onto my mom! I recommend this book to anyone concerned with their personal health or public health in general. however, I would consider it mandatory reading for every parent. Ruebush's point that super-cleanliness leads to super-germs must become part of the general consciousness. Germs are now my friends. Except the bacteria that produce botulism toxin. Not cool. I recommend this book to all my mommy friends. Especially those with young ones! It's easy to understand and very detailed about how the immune systems develops.